BOSTON — J.D. 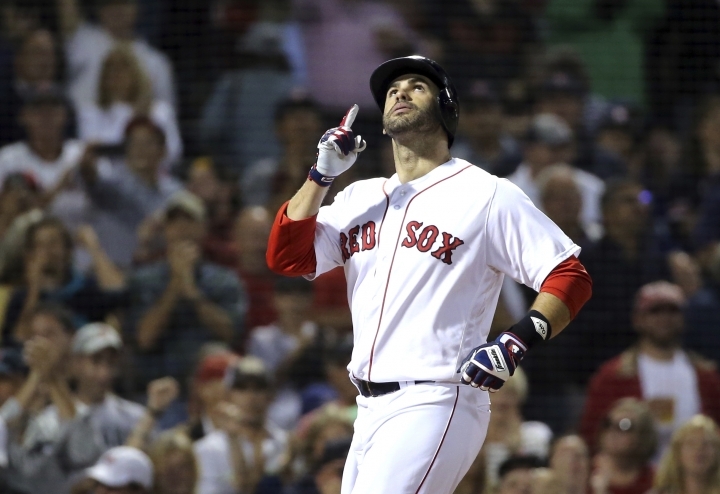 Martinez hit his 41st home run and the Boston Red Sox moved closer to winning the AL East title, completing a three-game sweep of the Toronto Blue Jays with a 4-3 victory Thursday night. Rafael Devers also homered for the major league-leading Red Sox (101-46). They pulled 10 1/2 games ahead of the idle New York Yankees and decreased their magic number to six for clinching a third straight division crown. 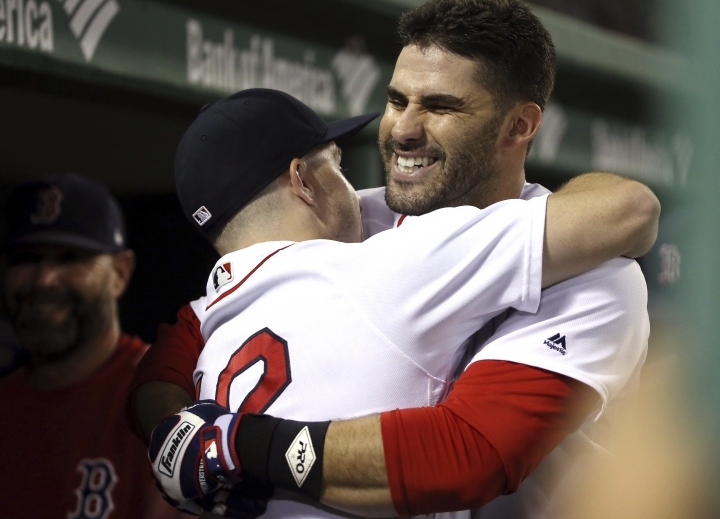 Boston is the only team in the majors that's already locked up a playoff berth. 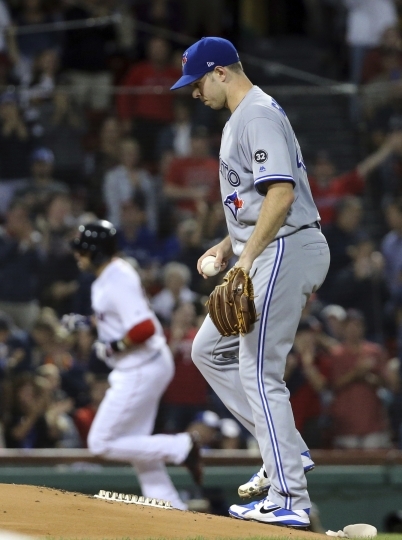 Brandon Workman (5-0) faced one batter, ending Toronto's eighth-inning rally, and got the win. Craig Kimbrel earned his 40th save. Danny Barnes (3-3) took the loss. DENVER — Nolan Arenado and Trevor Story homered, Kyle Freeland pitched effectively into the seventh, and Colorado beat Arizona to extend its NL West lead. ST. LOUIS — Manny Machado homered and drove in three runs to back Clayton Kershaw, and Los Angeles beat St. Louis in the opener of a four-game series between playoff contenders. The Dodgers snapped a five-game losing streak against the Cardinals and moved within one game of St. Louis for the final NL wild-card spot. The Cardinals, who went 22-6 in August, lost their second straight game and fell to 5-7 in September. NEW YORK — Michael Conforto and Todd Frazier hit back-to-back homers with two outs in the ninth inning, and New York stunned Miami in the first game of a doubleheader sweep. Conforto drove in three more runs in the second game, and Jason Vargas pitched six effective innings to help the Mets win again. In the opener, Kyle Barraclough entered with one out in the ninth and retired pinch-hitter Dominic Smith before Conforto lined a 1-0 changeup into the second deck in right to tie it. Frazier then hit a 1-1 pitch to left center field for his first walk-off homer since June 2015 for Cincinnati. Barraclough (0-6) blew a save for the seventh time in 17 opportunities. Jerry Blevins (3-2) pitched a scoreless ninth for the win. Rookie starter Sandy Alcantara befuddled the Mets, permitting just two hits, with his only real blemish coming off the bat of the opposing pitcher. Steven Matz hit his first career homer, a two-run shot in the second inning to tie it at 2. Peter O'Brien and Isaac Galloway went deep in the top of the second against Matz. In the second game, rookie Tomas Nido got New York on the board in the fifth with his first big league homer, a solo shot off Jeff Brigham (0-2). Vargas (6-9) allowed two runs on three hits, and Robert Gsellman worked around a two-out walk in the ninth for his 11th save. WASHINGTON — Javier Baez drove in the go ahead run with a bunt single in the 10th inning, and Chicago beat Washington in a makeup of a game postponed earlier in the week. BALTIMORE — Dylan Bundy had eight strikeouts in six solid innings, and Baltimore ended Oakland's six-game winning streak. Stephen Piscotty homered for the A's. They fell 3 1/2 games behind first-place Houston in the AL West and 1 1/2 back of the Yankees for the top wild-card slot. Oakland activated lefty Brett Anderson from the 10-day disabled list to make his 14th start of the season. In his return from a forearm injury, Anderson (3-5) allowed four runs and didn't make it out of the fourth inning. Bundy (8-14) gave up two runs and six hits to earn his first win since July 29. Mychal Givens finished for his seventh save. KANSAS CITY, Mo. — Salvador Perez and Jorge Bonifacio hit back-to-back homers during a four-run sixth inning, Heath Fillmyer pitched into the eighth and Kansas City beat Minnesota. Fillmyer (3-1) worked 7 1/3 innings, allowing four runs on five hits and matching his career high with six strikeouts. He left in the eighth with runners on the corners, both of whom eventually scored against relievers Brian Flynn and Brandon Maurer. ANAHEIM, Calif. — Nelson Cruz hit a three-run homer, Mike Leake pitched seven strong innings and Seattle started a 10-game road trip with a victory over Los Angeles. Cruz's three-run shot to center field in the fourth was his eighth homer this season against the Angels, the most a player has had in one year against the franchise, according to Baseball-Reference. Leake (10-9) threw a season-high 114 pitches (80 strikes), allowing one run and four hits with a walk and five strikeouts. His only costly mistake came in the seventh when Justin Upton homered. After going 0-5 in July and August, Leake has won two straight starts for the first time since June 12. Angels starter Odrisamer Despaigne (0-3) went one-plus inning, giving up three runs and four hits while facing eight batters.